Prior to leaving Saint Paul, my husband and I had time to grab a quick lunch with my sister-in-law before we headed out of town to our next destination for a couple of days. After having stopped at Just Truffles to pick up a few goodies for the road, my husband asked his sister what options there were in the vicinity where we could grab a quick, no-frills meal. After thinking about it for a few minutes, my sister-in-law mentioned the name of a place she hadn’t been to in a while, but was something different and perhaps unexpected that my husband might be interested in. As soon as my his sister mentioned the name of this eatery, my husband was all over it and wouldn’t be deterred from going to this place to see what they had. The Finnish Bistro, located in a nice, trendy Saint Paul neighborhood is a casual dining cafe featuring Finnish and European fare. As my husband and his sister both come from a Finnish background and grew up in a community that celebrated its rich Finnish, and Scandinavian history, my husband was intrigued by the chance to order up a traditional Finnish dish or two. 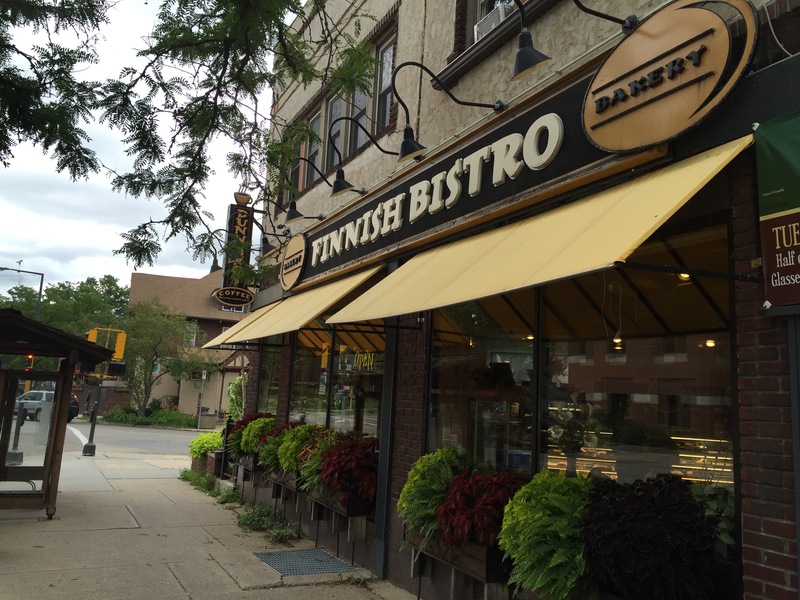 The Finnish Bistro, though having changed ownership in 2013, actually opened its doors in 2004 under the guidance of original owner Soile Anderson. Having moved from Finland over 30 years ago, Ms. Anderson started a catering company, which had the pleasure of serving President Barack Obama in 2014, and opening the doors to a store known as the Taste of Scandinavia Bakery & Cafe, showcasing Finnish, Scandinavian and European flavors. In 2004, the store was renamed the Finnish Bistro and specialized in good, healthy Finnish and European cuisine as well as some local flavors. Under the new ownership of Sandra Weise, this traditional continues today and makes The Finnish Bistro a terrific neighborhood gathering spot. We arrived at The Finnish Bistro in the late morning hours during that period of time where you could either be enjoying a late breakfast or brunch or an early lunch. As The Finnish Bistro serves breakfast, lunch and dinner, we really had a wide ranging selection of items we could order, plus a whole display case of fresh baked pastries, cookies and other goodies we could choose from as well. The Finnish Bistro, sharing a roof and an indoor space with Dunn Brothers Coffee located next door meant that I stepped over to the coffee house to order myself a caramelized banana ice latte to go with my meal. 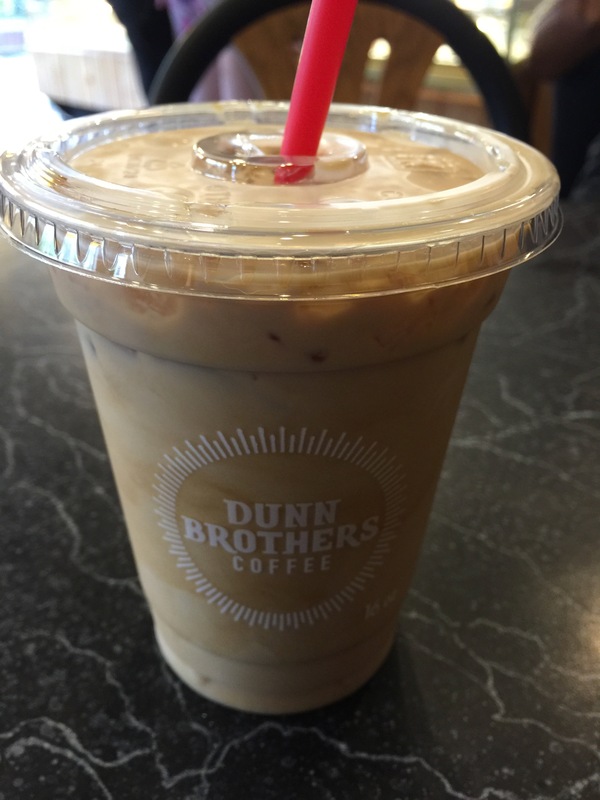 You don’t think I could see a coffee flavor with the name banana in it and not order it, do you? While I’m not sure that I actually tasted caramelized banana, there definitely was a subtle banana flavor underlying the iced latte coffee flavor that added just the right touch of sweetness to the drink. I approve. 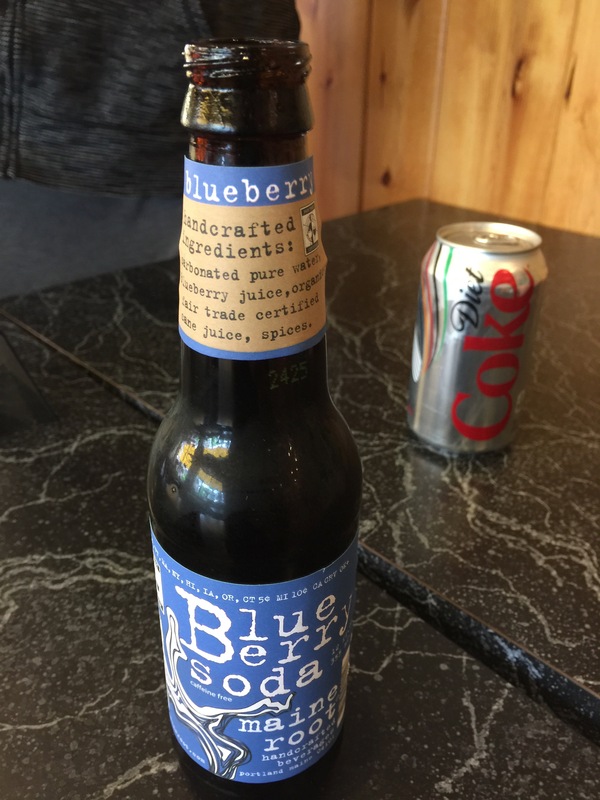 My husband ordered a bottle of Main Root blueberry soda to go with his meal. The soda definitely tasted like blueberries with just a touch of carbonation to add some bubbly. However, my husband thought it to be just a touch overly sweet and while he’s glad he tried it, he probably would go for something different next time. After perusing the menu, I knew I would be ordering lunch rather than breakfast as I knew we were about to hit the road and who knew what and when we’d be eating again, so I wanted something filling and hearty to eat. 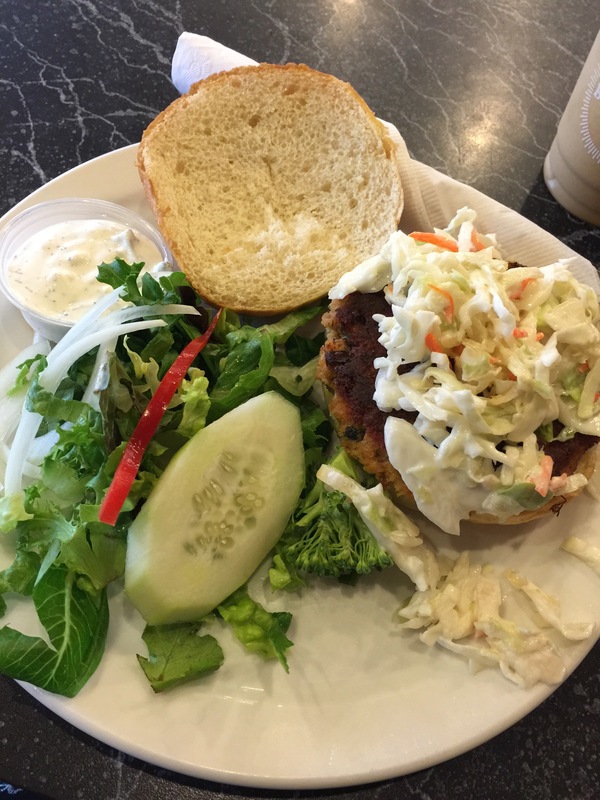 My choice was the salmon burger made with a fresh salmon patty seasoned with special herbs and seasonings and topped with homemade creamy coleslaw and served on a toasted honey wheat roll. The salmon burger was served with a small salad as well as a side of homemade cucumber dill sauce which could be used for the burger or the salad. This salmon burger was a bit outside of my comfort zone for several reasons. I’m not sure I’ve ever ordered a salmon burger before because the idea of a frozen salmon patty and how dry it would be just never sounded appealing and also for the fact that I absolutely hate coleslaw. Whenever a meal is served with coleslaw, I can’t get rid of it fast enough and generally won’t touch it. So, why I even ordered this salmon burger is beyond me, other than having read the description in the menu that this was a fresh salmon patty. Therefore, when the salmon burger was cooked to order and brought to the table, I was completely blown away by just how much I really liked my lunch. The salmon patty was fresh, and flavorful and delicious and not at all dry and falling apart. The salmon was still juicy and the patty held together really well and was just full of flavor and richness and texture that actually complemented the coleslaw really well. The coleslaw was chunky and thick and while creamy, the mayo in the coleslaw didn’t overtake the shredded cabbage and the julienned carrots. The coleslaw still had a lot of crunch and bite to it and had obviously been made fresh. The cool contrast in temperature between the coleslaw and the hot grilled salmon patty created a nice combination. And that amazing cucumber dill sauce which I slathered onto the terrific honey wheat roll was the perfect compliment to bring the whole burger together. Instead of using tartar sauce, this cucumber dill sauce complemented the flavors of the salmon patty perfectly and mellowed some of the sweetness off of the honey wheat roll. I’ve honestly never had a better salmon burger in my life, and I shocked myself by finishing the whole thing. My husband and his sister, in an obvious sign that they are family, both decided to order the same item off of the lunch menu. Their choice was the salmon lefse filled with salmon, spinach, red pepper and onions served with the house cucumber dill sauce. They were both so excited about ordering this dish as I believe it reminded both of them of their childhood and it was a bit of a reminiscing type of moment. Being the non-Scandinavian in the group, I’d never heard of lefse before and was completely clueless as to what a lefse was. I soon learned the lefse was basically a Norwegian form of a crepe, almost. 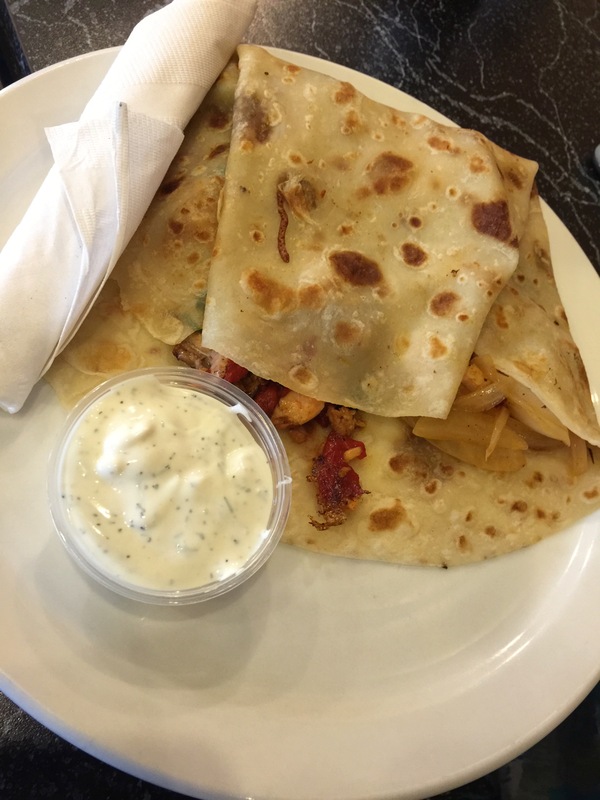 What makes it different from a normal crepe is that lefse is made with potato, flour, butter and either milk or cream. Growing up in Northern Minnesota, in an area heavily populated with families that are descendants of immigrants from Norway, Sweden, and Finland, Scandinavian favorites such as lefse were common place items. 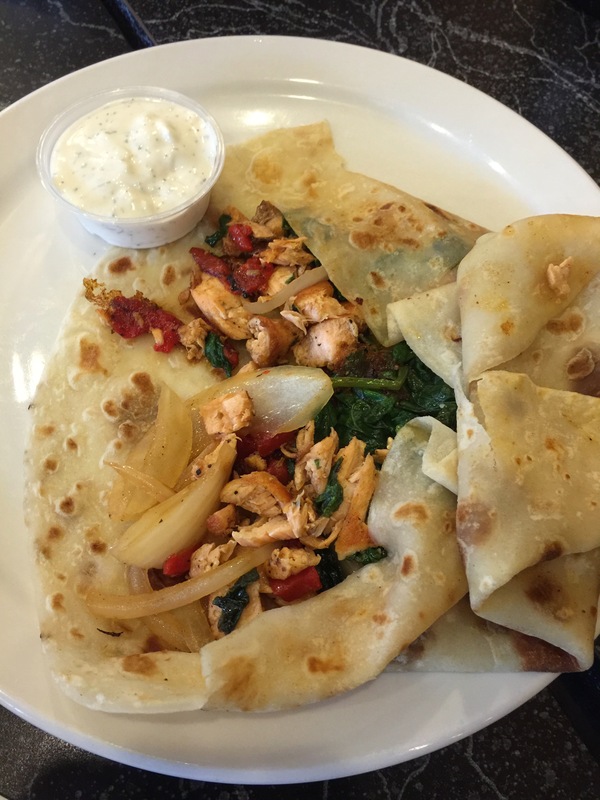 At the Finnish Bistro, a fresh made lefse is grilled on their flattop and filled with a combination of salmon, spinach, red peppers and onions and served hot off the grill to customers. As soon as my husband took his first bite, he loved it. He told me I had to give it a try because he knew I would like it. And he was right! I loved the flavors of the lefse, but then again, I’m a huge potato fan. It makes the lefse feel a bit more fluffy than a crepe and a bit more delicate as well. But the flavoring of the salmon, spinach and onions filling was just so fantastic. There were so many different levels of flavor, all of which combined perfectly with the lefse. Had I know that the dish was this amazing, I would have ordered a lefse for myself. The cucumber dill sauce was also a perfect accompaniment for the lefse. The dill was a great compliment to the salmon and the airiness and lightness of the sauce, almost more like the body of sour cream, was a perfect match for the lefse so that it wasn’t too heavy or too runny. I can certainly understand why my husband and his sister both decided right away that they wanted to order the salmon lefse. The taste was so fantastic, my husband was like a kid in a candy store. It turns out that my sister-in-law’s suggestion to grab a quick bite at The Finnish Bistro was a perfect selection. The Finnish Bistro was homey, and casual and delicious and apparently brought back childhood memories for my husband and his sister. The various menu items at The Finnish Bistro were so reminiscent of items that my husband and his sister grew up around in their own communities and in surrounding areas. But it wasn’t just that the food was familiar, it was that the food that we ordered was delicious and absolutely hit the spot for what we were looking at. Food to fuel us over the next few hours while we took a road trip north, the Finnish Bistro filled our bellies and livened up our taste buds. I would definitely dine at The Finnish Bistro again next time we return to Minnesota.